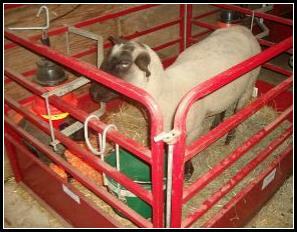 The Lambing Panels and Head Gate Lambing Panels utilize 1” square, 16 gauge tubing. They are available in three standard lengths and are 40” tall. 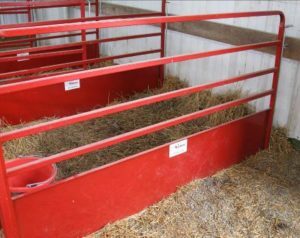 The 14” solid sheet at the bottom of the panels not only keeps lambs along with bedding in their pen, they also reduce cold air drafts on the lambs. Producers have commented on the reduced mortality rate of their lambs when they have used our lambing panels. 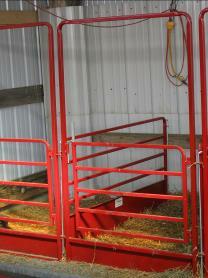 Panels are connected together with drop rods and pens can be free standing, placed back-to-back, or attached to barn walls. Multiple pen size options and endless configurations can be used to meet your needs. Panels can be used after lambing for setting up creep pens or show pens and can be attached to our Standard/Vertical Rod Panels and Walk Through Gates. Lambing is a critical point in the profit of your sheep operation so why not save time and money with an easy lambing set-up? Barn layout assistance available. One Drop Rod per panel is included in price.